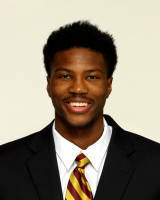 Strengths: If a team is looking for a spot-on perimeter shooter from the wing in the late first round, then Malik Beasley might be a right fit. Beasley is an athletic wing and an an explosive leaper besides only standing at 6'4". What helps the freshman out offensively is not only do teams have to respect his outside game since he shoots the three at a such a high percentage, but he has a quick first step that allows him to get at the basket and finish with ease. Although his size may not woo any NBA front offices over, the Florida State product can defend multiple positions and rebounds well for his position. He still has a lot to improve on, especially being a freshman, but Beasley wouldn't be a bad pickup if a team needs an immediate scorer off the bench. Weaknesses: As good of a shooter that Beasley is, he struggles mightily from the long-lost shot in the NBA: the midrange jumper. His ball handling skills are also an improvement he must make if he wants to succeed at the next level. With the way teams game plan individual players, he's going to have to learn to put the ball on the floor and shoot the ball off-the-dribble.